The 2018 Toyota Highlander is a tough SUV that provides upscale comfort and capability, coming stocked with a four-cylinder engine that earns up to an EPA-estimated 24 mpg highway, though drivers itching for more performance can opt for the 295-hp V6 engine instead. * This off-road-capable SUV rolls out on stylish 18-inch wheels and features an integrated backup camera and voice-recognition software that makes listening to music and making phone calls safer and more convenient. The 2018 Toyota Highlander is available at eight athletic trim levels: LE, LE Plus, XLE, SE, Limited, Hybrid LE, Hybrid XLE, and Hybrid Limited. Every non-hybrid trim comes with standard front-wheel drive (FWD) and available all-wheel drive (AWD). Hybrid models are offered with AWD only. 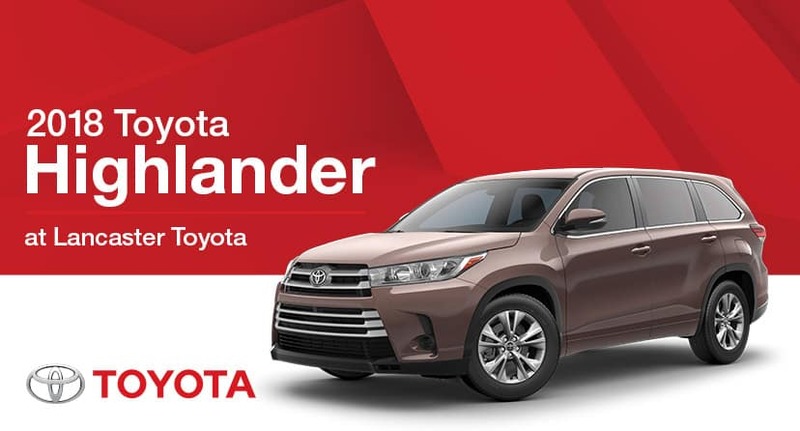 The 2018 Toyota Highlander tops most competitors and quenches a driver’s thirst for style, capability, and technology. The athletic SUV boasts an upscale interior as well, so come see everything the Toyota Highlander has to offer at Lancaster Toyota.